Has Real Estate Blogging Gone Too Far? The real estate game has shifted and morphed over the years, heated and always moving. The unpredictability of the game can be largely attributed to the technological leaps and bounds achieved in the last few decades. These days, anyone that wishes to have a voice can get their word out with a few strokes of the keyboard and a click of the mouse. In 2018, information is plentiful and readily available. Unfortunately, it would appear that the surge in quantity has allow the writing quality as a whole to languish. Saturation in real estate blogging has become a real problem, to the point that its long term effects have been felt in the market at large. 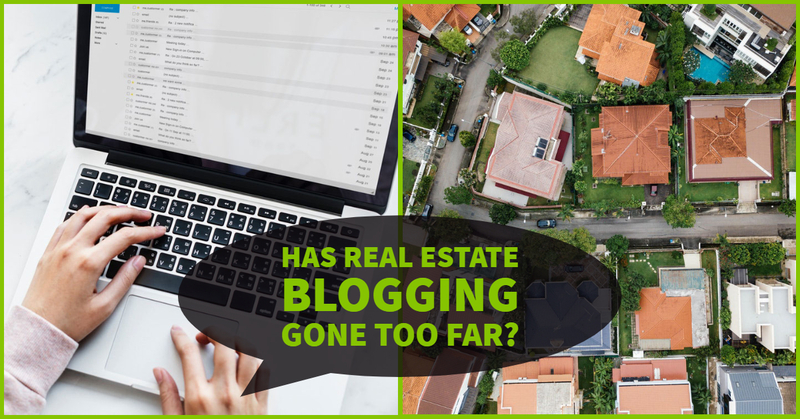 The saturation in the real estate blogging market is partially in part due to the fact that anyone and everyone can stick their digital foot in the door of this fine establishment. While it is great to know that accessibility is on the rise for this growing institution, it is an unfortunate fact that more and more articles written by people have little to no understanding of the intricacies of the field. As a further example of the consequences of the internet and online sphere being such a double-edged sword, there has been a disturbing lack of fact-checking and conformity to facts. This general disregard for well-researched information is supplemented by the propensity of the average consumer to seek literature that caters to their own inherent biases. For example, an individual looking to sell their home for the first time may sift through thousands of well-founded articles advising temperance, only to act on the very first article of their liking that proves otherwise. Another negative contribution to the saturation of the real estate blogging market as a whole is the presence of article mills. Article mills consist of rotating pools of clients and authors. Authors, a.k.a. “Those That Write”, may find the completion of the article more important than the content of it, being that time is money. In a job where the quantity, as opposed to the quality, is what garners the most profit in the shortest amount of time, facets of news such as the truth tend to fall to the wayside. One would think that any unsavory or uninformative content would be rejected by the clients. Unfortunately, this is not so. Most clients who request articles from freelance writers do so to fill quotas in their SEO marketing operatives. While some clients to take pride in the content of each individual article, most are satisfied merely by taking a barely intelligible article with little more than key search words haphazardly thrown into the mix. So why is a real estate agent eager to get his or her feet wet, to play a game filled with such an abundance of repetitive content and inaccuracies? The key to differentiating between the scum and the cream, the information and the fluff, lies within specification. It is a given that the average person visiting a real estate company's resources wants to buy a home or sell a home, but the reason they arrive in the first place requires a blind leap into the specifics. A specific, informative article title will do wonders for increasing traffic and conversion to any real estate blog. For those completely in the dark, the following article titles are great examples of what NOT to use, and should be avoided at all costs. This is the first in a two-part of "hows". This first How has the potential to come off as offensive to both potential buyers and sellers. Even the most green and naive potential seller may take this article title as a mild affront, as the fact that they are looking for house-selling advice should not need to be said at this juncture. Veteran real estate agents may take a vague title like this as an insult to their intelligence, as well as an indicator that not enough time has been put into this article to make it of use. This How is a little more forgiving due to the target market audience in question, but should still be clarified to increase traffic and turnover. Articles such as these give casual readers the idea that the article within will be generalized and not as informative as they (especially if they're first time home buyers) would like. It is a tall order to fit all of the logistics behind buying a home into one article. those like it should only be reserved for those most lacking in fundamental knowledge of the real estate game. Interior decorating can be a finicky science, one that is subject to many variables and calculations. While there is a considerably smaller amount of information to digest when it comes to renovating a house for potential clients, it is still not a matter that should be painted with a broad-brushed solution. As with any other facet of the real estate game, blogs about interior decoration should be catered to niches and subsets of society as best they can, so as to gain traction in the target market. As an agent, it is one's goal to be personable and warm, something of a living extension of the house itself. However, one must be careful not to make the blog completely about the agent. This detracts from the point, reducing interest in readers. If you have questions, try talking to your local trusted real estate agent… and don’t believe everything you read.